By Kori ~ July 17th, 2013. Have you ever wanted an easier way to keep a bottle of wine cold than using an ice bucket? 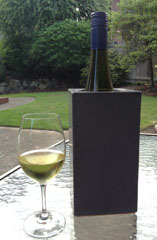 What about keeping a bottle of white wine chilled that you are taking outside for a meal in the backyard? How about keeping a bottle of red wine from getting too warm on a hot summer night? If any of these situations have come up for you as they often do for us during these warm summer months, I encourage you to check out the Angle 33 wine thermals. Made in Missoula, Montana, Angle 33 wine thermals are made of concrete and utilize the laws of thermal mass, not ice, to keep your bottle of wine at its ideal serving temperature. Angle 33 offers the wine thermals in three sizes and five different colors to meet both your wine and decorative needs. While not inexpensive (the standard size retails for $64.99), these wine thermals can be an excellent addition to your entertaining repertoire. Since many months of the year we are forced inside by the Seattle rain, we love spending as much time as possible in our backyard during the summer. Whether it’s a weeknight meal or a weekend BBQ with friends and family, we frequently enjoy wine with food. The last thing we want is for our Sauvignon Blanc, RosÃ©, or Cabernet Sauvignon to warm up too fast. Recently, we received an Angle 33 wine thermal as a sample. The one we tried is the wine thermal, which holds standard Bordeaux-style bottles. The pepper color, as you might expect, is dark gray to almost black and complements our dÃ©cor very nicely. Over the course of the last couple of weeks, we have put the Angle 33 wine thermal to the test. It has been a very attractive addition to our table. And, most importantly, it works as advertised. Matt and Marge Baack are the owners and founders of Angle 33. Matt has been in the concrete business for over 14 years. He also owns and operates Stamping Ground Studios, which specializes in decorative concrete countertops, concrete furniture, and stained concrete floors. The idea for Angle 33 wine thermals was born after Matt and Marge had a disastrous dinner experience with a messy, drippy ice bucket at an upscale restaurant. The seed was planted and Matt set out to create a solution using the medium of concrete. It is important to note that the most important thing you can do for your wine is to store it at its ideal temperature. Assuming youâ€™ve done that, you can grab a wine thermal off of your kitchen counter to keep a chilled bottle of white or rosÃ© cool for up to 45 minutes or a bottle of red at cellar temperature for up to 90 minutes. To extend the amount of time that the thermal will keep your wine at its ideal temperature, you may pre-chill the thermal in your refrigerator or, in a pinch, in your freezer. That said, we have found that we most often keep the thermal at room temperature and grab it as we head outside with a chilled bottle. And, letâ€™s be honest, folks, itâ€™s not often that an open bottle lasts more than 45 minutes anyway. While our use of the Angle 33 wine thermal is from the perspective of a consumer, it is also an ideal solution for restaurants and winery tasting rooms. Thermals can even be customized with a businessâ€™s logo or with other artwork for a special occasion. Have you used the Angle 33 wine thermals? If so, how have they worked for you? Full Disclosure: We received this thermal as a review sample. Thanks for the tip! Keeping red wine cool in a hot tasting room during the summer is always problematic. These may be the solution. Ordering some today. Glad to hear it! Let me know how they work out for you. Cheers! I saw those guys at the Seattle Wine & Food Experience, seems pretty cool! The thermals work well. Hope you have the chance to check them out. Cheers!